Looking for a bank who can refinance 3 car washes and pull cash out. Strong equity. Loan amount to be 2 million. All three worth over 4 million. Located in Utah. Looking for fixed rate options. Company is looking for a bridge loan of $250,000 through the next 90-120 days. Closing a $7MM+ round in 60-90 days. $27MM valuation. 5X of revenues from last year. Please contact Bill VanOverbeck (VanOverbeck@hotmail.com) for details. Raising $1m to acquire 33% minority equity stake of a founder-owned, home product company. Buyout Team is planning to scale marketing efforts and increase manufacturing efficiencies. Packaging the company to sell in 3-5 years. Target Exit $12-16M. Target IRR Range 30-35%. I have a client looking for a real estate loan again a lumber yard in North Carolina. I’m told the property recently appraised for $2mm and is currently owned free and clear (all unverified). Feel free to email me (lincoln@vettedfunding.com) or call me (801-809-4713). Happy Fall Everyone!! I hope the changing seasons find you well. We want to remind everyone that the AFN Top Golf event it tomorrow – Tuesday October 23rd – from 11:30 to 1:30. Please stop by for a minute to say hi or a couple of hours to hang out. This will be a great opportunity to network and take out some stress on a golf ball. We look forward to seeing you there! Don’t hesitate to call with any questions. – Vendor Financing: If they are a manufacture and would like to offer in-house financing to their buyers, allowing more sales to occur for the company. – Third Party Financing: If a client wants to own the equipment but has a third party client leasing it. We can provide customized financial solutions for business base on our decades experience of financial engineering and underwriting equipment. Our financing process is streamlined to allow for quick approvals, fast underwriting and timely closings. One can start the review process by going to www.equipmentfundinghq.com. Questions can also be submitted to apply@equipmentfundinghq.com. AFNUtah would like to invite you to Top Golf for a fun lunchtime networking event. Come stop by for a few minutes or spend two hours. Lincoln Scoffield is our sponsor and host for this event. A huge thank you to him. We have scheduled Thursday, September 27th from 8:00-10:00 AM at the Miller Campus of Salt Lake Community College. Please note we will be meeting in a different room this time – same building, but on the first floor where the Goldman Sachs program is normal conducted. Tomorrow we would like to establish the board, future meeting schedule, including a fun event, and newsletter editor. We’ll then get back to guest speakers each meeting. Feel free to reach out to Ben or Denny with any questions and we look forward to seeing you there!! Do you see opportunities to grow your business but are not sure where to start? Could you use a support network of other entrepreneurs who face the same challenges that you do? A practical, hands-on 11 session business course where Business owners learn to identify opportunities, development leadership skills and maximize business operations. Participants receive one-on-one advising, create their own customized business growth plan and make invaluable connections. For those that are selected, the program is FREE. Looking for someone willing to provide a loan against an emerald. The borrower is looking for $5MM, and has an insurance policy for $50MM that will cover lender against any default on loans against the insured stone. If you feel you have enough interest to learn more or know someone that might be interested, please call Cody Brown at 801-819-2345. He is working with the prospective borrower. I hope everyone had a great summer and was able to get away to some far off sandy beach and came away with a beautiful golden tan. School is back in and summer is almost officially over, so it’s time to get together for our networking meeting. Keep in mind these meetings are an opportunity to expand your network, learn about the landscape others are seeing in the market, and potentially find deals to work on and close. I know there have been multiple connections that have resulted in closed deals through our group, so if you are not participating, you are missing out. We also have invited a few transactional lenders from banks to join us this time, so it will be a great opportunity to meet them and add to your referral sources. I have a customer looking some financing to help with some restructuring of their company. They have a great product that they sell either directly to or through distributors to municipalities, police departments, and emergency aid companies. They are needing approximately $150,000 – 300,000 to cover some operational costs involved with their restructure. Their are limited on collateral, so are willing to consider equity investors. Their margins are amazing and there is good demand for their product. If you have any interest in getting further details, please call me at 801-462-1961. Home care and hospice company looking for approximately $500K in financing to help with upcoming growth. Cash flow is strong, but collateral is limited. Company has been in business for approximately two years. Client has upcoming contract, as well as the opportunity to expand into additional markets, that will increase revenue substantially. Please reach out to Boyd Cook at 801-503-7420 with any interest or further questions. We are pursuing a 56 unit multifamily property portfolio in North Carolina. sitting at a 10.16% cap rate, in a market that averages between 7 and 8.5%. The owner is motivated to sell all of his holdings in the area and would like to retire. The 56 units are across 8 separate parcels, bundled into one indivisible sale. Our short term strategies include increasing rents to market as leases lapse and fixing and leasing up one building of 6 units that is currently vacant. This rehab will cost an estimated amount of $100,000 and take around 6-8 months to complete, upon completion this will add around $2,400/mo in gross rents. Currently, rents are around 70% of market rent values, allowing for an increase of $69,323 to NOI (including the vacant 6 unit building), and $815,564 of forced appreciation to the value of the portfolio at market cap rate. This will put the portfolio evaluation at $2,159,729.42 at the end of two years. At this point we will obtain bank financing at the higher evaluation to pay back our partners’ investments. To fund this transaction, we are seeking $1,225,000. This will allow for a cash purchase of the property and the needed rehab costs for the vacant 6 unit. By seeking private funding through partnerships, this will allow us to grant returns in ways more advantageous than simple monthly debt service. Please call Caleb Riddle at 347-722-0560 or email at cmriddle21@gmail.com for more information. Thank you for those that came out this week, it was a very productive meeting. We are going to open up the directory to make it a public resource. Please update or complete your information on www.afnutah.com/directory as soon as possible. The posts that you receive via email are going to be closed to the public. A LinkedIn page for the group has been created. Please give it a follow. We’re working on making it better. Quarterly morning meetings will be held, locations TBD; however, the SLCC seems central and they are willing to host us effortlessly. Any suggestions are welcome. A few topics for guest speakers and panels were given. We’ll work to make those very informative. Some topic suggestions were new products, regulatory changes, economic outlooks, etc. Social events will be throughout the year. We’ll look to a TopGolf event during lunch in the next month or two. We will also look to partner with some other groups for some of the social events. Member expansion was encouraged to expand our network and deal flow. For example, Brad Bertoch has a list of revolving loan funds that we like to have join us. If there are any specialty bankers that you would think be fit, please invite them. A newsletter will be generated to give general updates and news, as well as spotlight a few members each time. We would love to add any success stories that came from the group. Also, we can promote any event or make any announcements you would like to the group. We are excited to get going again. A few referrals were generated and it was good to see everyone face to face. I have a client that has an online furniture company and is seeking a loan for 24 months. The furniture is drop shipped from the manufacturers warehouses to the customers. The company lost money for the last three years and has made significant improvements each year…especially in 2015. The company had two partners and one was cashed out in 2015. Sales in 2015 were just under $7M. They are seeking a loan for $300k. We are looking forward to seeing you all again next Tuesday. You must take the elevator to the third floor. I have a contact that is currently located in Denver but is wanting to move here to Utah. Benjamin Stephan is seeking a move to Utah in the immediate future. He has five years of experience in microfinance, impact investing, grantmaking, and strategic philanthropy. He would like to explore any relevant career opportunities in Utah and would be happy to connect at benjaminfstephan@gmail.com or (703) 338-6239. Thank you for your time to help out this highly qualified finance pro! With Spring upon us, its time for a fresh start and some cleaning with your Alternative Funders Network. There there have been a number of changes for many you, so another meeting would be a great opportunity for everyone to get together and spread the news. Now would also be a good time for everyone to review their contact information on the website (www.afnutah.com) to ensure it is accurate and complete. A complete bio/contact information will help our network. With all the changes, we might not have everyone’s new emails. Please pass this email to anyone you know in the group or who would be interested in joining us. AFN will be putting a board together and would like as much attendance as possible to help ensure the best ideas and suggestions are represented in regards to the purpose and direction of the group. A number of people have indicated interest in being on the board. Please feel free to reach out Denny or Ben or simply be ready to discuss at the meeting. There will be no formal presenter at for this meeting. Let’s get going again. We are excited to get moving, see a few people we haven’t in some time, and network to grow our businesses. Hydrogen on Demand Professionals is seeking $2.5 million to fulfill needs of current customers and to hire personnel to meet demand. Please see our current funding round @ www.fundable.com/hydrogen-on-demand-professionals. We provide patented cutting edge technology to improve the fuel efficiency and reduce the emissions of all types of diesel engines (marine, oilfield, power generation, trucking, etc.). Our system is inherently safe due to the fact that we use no caustic materials to make the Hydrogen and no Hydrogen is ever stored. In this first round we are looking for $2.5 million with a minimum investment amount of $50,000. Please see the AFN page at www.afnutah.com for the updated information and link. Please note the date change to May 8th! I would like to extend an invitation to an upcoming CPA conference on May 8th. It should be a great opportunity to network and build relationships. If you or someone you know can attend, please make preparations to be there. Please also don’t hesitate to call me with any questions. The details can be found in the following link. One year old company recently obtained a five year contract (~$83,000/month) with the State of Utah for railroad maintenance. Looking for $45,000 in new equipment and $20,000 start-up costs. Has $343,000 of heavy equipment on the balance sheet that can be pledged as collateral. My quick UCC search on the Utah SOS showed no UCC filings. Equipment listing available upon request. Owner had a bankruptcy a few years ago. Business operating breakeven, slightly positive. Please contact me for more information and will make an introduction to the company. We can double or triple your current rate of return backed by real estate! Senior and junior real estate investors seeking funds for local fix and flip project in Salt Lake City. Showcase historic remodel on a 9-12 month timeline. Looking for 200k in second position or 700k in first position. We have 10+ years of proven local real estate success. If you or someone you know is interested in making some great money please call Caleb Riddle at 347-722-0560 or email at cmriddle21@gmail.com for more information. Thank you. I have a contact interested in a selling a note. It comes from him selling a condo unit of which all 16 units were sold the same day, to the same seller. The unit was sold for $70,000. Received $12,500 down payment. Financed $57,500 @5% for 60 months with a balloon of $52,943.53. Payments are made by the buyer (for all 16 units) to the Title Company, then once the funds are cleared, a check from the Title Company is sent to each seller. Paid 10 of 60 payments. Amortization schedule available. I have a client that does residential remodeling in Rhode Island and is looking for approximately $250K to help with working capital. She works with homeowners and has grown her business quickly, but has taken out some short term financing that has crippled her cash flow. Her credit is poor and I think this is a tough deal to get done, but if you feel like you might have an option please call me and I’ll get you in touch with the prospect. I have a small supplier that is looking for $50-100K to help supplement inventory purchases. He purchases product from Korea and is able to turn it very quickly through his distributors. His challenge is being able to maintain enough inventory to keep up with demand. There is no real AR to speak of, as many of his sales are cash transaction, but lack of sufficient inventory is holding him back. If you feel you may have a solution, please call me and I’ll get you in touch with the prospect. I have a group purchasing a trucking company that is having a hard time getting senior financing since they are putting in very little equity. They have some sub-debt lenders lined up to complete the transaction, but need to take out the current senior lender to make it happen. There is about $6.5 million in AR and the target company owes $3.5 million on the current senior line. The issue has been timing as their window on the purchase agreement is closing. They need to fund that $3.5 million in about a week. They are not rate sensitive as they feel they can get a traditional factoring line after they have purchased the company. Let me know if that is something you can do in that time frame. Rapidly growing 13 y.o. long-term care provider that offers care and treatment to persons with disabilities in Utah and surrounding states. Seeking $600K RLOC on monthly billings that range from $600K to $800K. Seeking 75% advance rate, offering first position UCC. Source of payment for services is US Federal Medicaid program. Receivables turn is 5-7 calendar days. Pls contact me directly if interested in this opportunity. I have an investment banker who is putting together a deal for the purchase of a sizable ($130 million revenue) trucking company. He is looking to get his $300,000 fee factored. The trucking company does not have a problem paying him. They just need to wait a couple months until they have completed the purchase and can start paying some of those bills. Let me know what you might need to review. Good afternoon everyone!! Thank you for participating in our network of alternative financing professionals to help each of us grow our network. I know I have developed many relationships that I otherwise would not have had if not for this group. It has been a great resource to be able to pull up our directory when I run across something that needs a creative mind and find a few possible funding sources in our network. I have closed a few deals for those in our network that have been able to send things my way as well. Ben and I have been privileged to organize and manage the meetings and events that have come up, but the time has come to turn this dictatorship into more of a democracy. We are looking to get volunteers to help form a board. We need to make sure we continue to grow and manage the group in a manner that is beneficial for all, and in order to do so, we need the help of our group members to help form a decision making body that will help define our direction moving forward. Please let Ben or I know if you are interested in helping out with your incredible intelligence and leadership abilities (mediocre abilities are fine, too). These are unpaid positions, though you will be compensated generously with many handshakes and pats on the back from our fellow members. Please be willing to help us make our group beneficial for all who participate. Thank you in advance. Join us for an exclusive event featuring Euler Hermes Chief Economist, Dan North. As preferred partner of Euler Hermes in Utah, I’m excited to extend an invitation to this event for AFN Utah members. The event is being co-sponsored by Zions Bank and Utah Manufacturers Association. I hope that you can make it, and please feel free to pass this along to any of your clients and/or colleagues who might like to attend. If you haven’t seen Dan North before, this is definitely not something you’ll want to miss! Please use the “sign up today” link below to register so we can make sure to have adequate refreshments and seating. During this invitation only event you will be provided with actionable economic intelligence and analysis to help you steer your business. The more you know about your buyers, your industry, and your world, the more strategic you can be with your business decisions. Recent developments regarding the consumer, manufacturing, housing, employment, exports, and global cross-currents. After the presentation you will have the chance to ask Dan any questions and interact with him directly. Please note we will be starting promptly at 8:30 to be respectful of attendee’s time. As one of the leading U.S. economists, Dan North has appeared on CNBC, Fox Business News, ABC News Now, France 24, and Bloomberg Radio and Television. He has been quoted by USA Today, Barron’s, Bloomberg Business Week, The Washington Post, Paris Le Monde, and The Wall Street Journal. After having predicted the 2008/2009 recession and its implications accurately, Dan North was ranked 4th on Bloomberg’s list of the 65 top economic forecasters in 2010 (view Dan North’s full bio). Just a reminder our next meeting will be this Wednesday, April 26th, at 8:00am. It will be the standard format for introductions and networking. We have Robert Spendlove, an economist, as our quest speaker starting at 8:15am. VentureCapital.org has been so kind to offer discounted/free tickets to their upcoming Deal Forum. If you have not attended before, its a great event to see new companies and meet new people. Get your ticket here and enter promo code AFN_Guest. A huge thank you to Brad Bertoch for this opportunity. 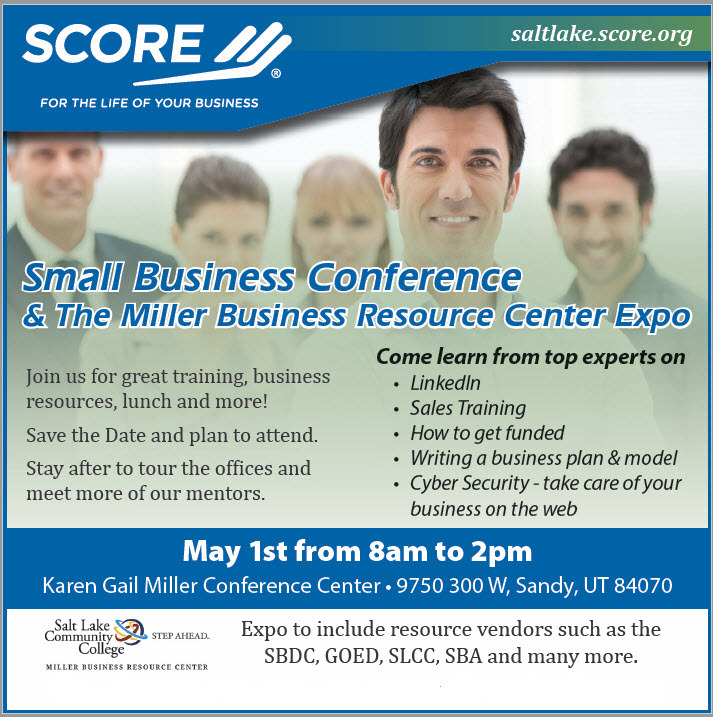 As a member for AFN Utah, you are invited to attend the SCORE Small Business Conference & MBRC Business Expo. Monday, May 1, 2017, 8 a.m. – 2 p.m.
Join them for great training, business resources, lunch and more! Free lunch (donations are appreciated! ), with a great keynote speaker – Fred Lampropoulos: From Utah to International Success. Learn more about exporting and how it helped his business thrive. Our next meeting will be on Wednesday, April 26th, at 8:00am. It will be the standard format for introductions and networking. Thank you to all that filled out our survey. We are excited to return to the Miller Campus. We’ll have signs directing to the conference room. Just a reminder that you must take the elevator to get to the third floor. We have some exciting speakers lined up and look forward to see you all there. I have a gentleman looking for $60K to complete a project in Mississippi on a single family residence. He has been contracted to tear down an existing structure and rebuild a home there. He will take ownership of the property, but there is already a buyer under contract with a loan approved by the bank for the purchase of the new home once constructed. Sell price will be approximately $111,000 and he has approximately $20K of the $75-80K needed to complete the project. Project should be completed within approximately 75 days. Please call me if you are interested in further details and I can put you in contact with the prospect. Denny Goodenough 801-462-1961 dgoodenough@vertexfinancial.com. If any of you know of investors in the commercial space, particularly in SLC and Denver area who in need of 5 mm plus in bridge-rehab capital please let me know. I have a lender who is very eager to get into these two markets. They work fast and have great rates and terms. Again, any 5 plus million dollar rehab or adaptive reuse projects in SLC or Denver. Prospect is looking for loan to purchase a party/entertainment business. Very small company being sold for $100K, with $50K seller financed. Some equipment, some blue sky. According to prospect, business had nearly 50% net profit last year. Would prefer debt, but would consider an investor. Please call Caleb (prospect) at 347-722-0560 or Denny at 801-462-1961. Deal Specifics: CEO/Owner needs to $280,000 of payroll taxes to be paid off in exchange for equity. Once the debt is cleared, the underwriters will proceed with process and try to get the SBA loan approved. Once, the loan is approved equity partner that paid off the payroll taxes will be paid back their principal plus “interest”. CEO/Owner is willing to negotiate aggressive terms to make the deal work. Or is also open to other deals that may give him access to the necessary funds to buyout his partners. If you have interest or will like to find out more, please call Denny Goodenough at 801-462-1961 or Henry Alvarez (company consultant) at 801-865-1662. We sent out a survey today to help us pick a date for our next meeting and gather suggestions for our group. It appears it is ending up in the junk folder for many. Would you please take moment and respond. Anyone know who would finance a cruise ship appraised for $18.4MM that is US Coast Guard flagged and certified? Outside my experience, but just came across my desk. We are planning our next AFN meeting to occur at the end of April, after Spring Break. Everyone should be refreshed and ready to finish strong before the slow down of summer sneaks up on us. Until then, please feel free to use our network (70+ members) to post anything you would like to send out. That could be job postings and seekings, deals, referrals, events, etc. If you have any suggestions or thoughts about our group or future meetings, please feel to reach out to myself or Denny. May your Holiday Season be joyful and bright. Thank you to Brad Bertoch and his team for hosting this event. We would really like to focus on networking and getting to know one another better this meeting, so the format will be a little different. So come really to hand out cards and find some new opportunities. Just a reminder to fill out your profile in the directory and we can now add a LinkedIn button. If anyone has an event, announcement, job posting, need something, etc., please let us know and we are happy to post it to the site. We have 66 members in our directory that will receive the post via email. We have added an input field to your profile so your LinkedIn profile can be clicked on within the directory. Please take a moment to update your profile, including your LinkedIn. We are looking to schedule our next meeting for the second week or so of November. For this meeting we would like to do something more informal, a gathering, an event of some kind, maybe charity related somehow. If anyone has any suggestions, please feel free to reach out to me or Denny. Have an inquiry from a sub-contractor desiring to factor one invoice for 509K. Job was performed for State of New York, therefore not lien-able. Contract has pay when paid clause, 10% retention, terms net 45 days. Date of progress billing began Mar. 29. Prospect can’t get paid, General claims State is performing an audit. Prospect emphatic will not factor other accounts. If you have an interest in this feel free to contact me. Manage all aspects of the development, delivery, evaluation and reporting of UMLF Technical Assistance programs and services; program evaluation, program marketing, program administration reporting and other duties acting in the capacity of the ED when necessary. Responsible for quality loan production including business development, networking, relationship management, loan approval, closing, repayments, and impact reporting. Analyze and evaluate loan applications and make appropriate recommendations as needed. Participate in overall portfolio monitoring. Work with new and existing clients to build financial capacity, develop short- and long-term strategies, and access to capital sources. Please contact me with any further questions or candidates. • 2nd guarantor has clean credit with minimal debt and minimal assets as well. He is a residential home builder who has limited operating revenues the last few years. The 2 guarantors are brothers. Please contact me if you have an interest in this opportunity. Company is a start-up, but will provide water treatment for municipalities, oil and gas, mining, power plants, etc. Company will have A/R financing need, which we are looking to provide, but need to first find initial capital injection through a term option. Seeking between $1.6 – 5.7MM. Please contact Denny Goodenough at 801-462-1961 or at dgoodenough@vertexfinancial.com for further information. One of my startup clients just verbally secured $1MM in debt financing. The investor is using their IRA account to fund the loan. It will take about 30-45 days to setup. The funds are needed today to deliver a contract. The lender is willing to secure a short term loan with their IRA. Is anyone interested in doing a $1MM secured loan for 30-45 days? One in Bountiful, a high end spa that has been open for six months and is making money. The wife has health problems and they are looking to sell. They paid $400,000 to get it open and are asking for $375,000 they will provide financials. Two concepts that are selling like crazy in other states that want someone to buy all of Utah and be the only franchisee, both with $250,000 all in investment. One concepts that is the Trader Joe’s of dog care, have 50 stores open on the East coast and have decided to come west. $750,000 all in investment but none of their stores have closed in over 20 years, all make great money, and the company itself is incredibly strong. Another concept that has contracts with Marriott, Hilton, Hyatt, and many more hotels, waiting for a franchisee to open shop so they can leverage these contracts in Utah. A local insurance company is looking for approximately $50,000 to pay out a non-compete settlement. They have been in business approximately four years and are open to creative solutions. Funds are needed by June. Please contact Denny Goodenough at 801-462-1961 with any interest. An energy company with presence in the US, but headquarters overseas, is looking for capital to complete R&D and fulfillment on purchase order. Project is longer term than normal PO finance would allow. May be a great fit for seed or venture capital, as they are willing to utilize equity to raise the needed funds. Please contact Denny Goodenough with any interest or further questions at 801-462-1961. I have a client looking for a line of credit to back their consumer lending portfolio. They provide financing to consumers for 1 – 2 year terms. Please contact Denny Goodenough at 801-462-1961 if you have interest. I have a high network client with over $100,000 in revolving credit card debt. The are looking for a lender that will consolidate their credit card debt into an installment loan and allow them to keep their credit cards open. Client has good credit and strong income. We have a company that is placing ATMs in many hotel locations and they need a company that can handle the processing. Please contact Josh at 702-408-4933, please send a text as that will allow for a quicker response. A consulting company for which I posted earlier about, has signed another contract for next season. This gives them four contracts for professional sports teams (NFL, NBA, MLB and hockey). They are looking for an advance against these contracts. The contracts are in excess of $1,000,000. Needing $250,000 to assist in hiring key staff positions and analysts. Please contact me directly if interested and I will make an introduction. Loan Amount of $250,000 with desired 2-3 year term, fixed rate, 20-25 year amortization. Investor property that currently has 3 rental units, but will have 6 units once the buyer renovates the property. Seasonal company looking for $100,000 loan to carry them through their off-season. No collateral is available, so loan would have to be unsecured, although they will have purchase orders and AR in the fall. Would entertain payoff in October or a longer term if available. Company was formed in 2012 and revenue for 2015 was approximately $1.6MM. Call Denny if interested at 801-462-1961. A manufacturing partner is looking for ~$500,000 to facilitate 20,000 to 50,000 unit backpack PO for a large energy drink company. Eco Safety Products is the first and only full line sustainable chemistry manufacturer that produces coatings and chemicals that facilitates safer buildings, materials, occupants and environment through intelligent use of renewably sourced ingredients to surpass the high growth global high performance green building standards. Ski helmet manufacturer has invoices of $500,000 which he would like to advances of $120,000 now and another $120,000 at the end of December. All invoicing is due end of January. Account debtors are various ski retailers across the country. Size of account debtors varies as well. The company is looking for a factoring type of arrangement however is very concerned over the notice of assignment.